Fiammetta is a name of vessel Nautitech 46 Fly ,which was produced in 2019. Fiammetta is furnished with 10 beds. Beds on the vessel are arranged in 10 layout. 6 cabins are located inside the sailing boat Fiammetta. Passengers can feel good on this sailing boat , because there are 4 bathrooms for their disposal. Fiammetta is supplied with motor 50. 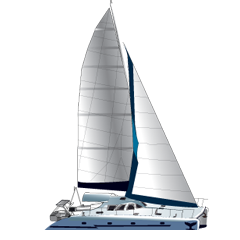 On the vessel is placed following equipment: Self-tacking jib , Furling mainsail, generator, Air conditioning, Water maker, Gps plotter, Autopilot, Dinghy, Hardtop. . Deposit has value 5000.00 EUR. Nautitech 46 Fly STEFANY - Air condition with Generator, NEW!